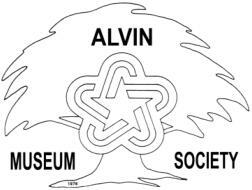 The Alvin Museum Society's Fall Membership Meeting will be Sunday, October 23, 2011, at 2:00 p.m., at the Alvin Senior Center, 309 W. Sealy. Mr. Tom Green of Pearland will present a program on "Historic Flags of Texas." Mr. Green is active in both the Sons of the Republic of Texas and the Sons of the American Revolution. He is a member of the American Legion and the North American Vexillogical Association and has collected or made over 60 historic flags. You will have a chance to ask questions and view the flags he has on display. There will be refreshments and announcements. We look forward to seeing all of you on Sunday, October 23! !